At their recent F8 conference, Facebook’s newly appointed Chief Product Officer Chris Cox noted that Stories are on track to surpass the News Feed as the primary way to share content on social platforms at some stage this year. It’s not the first time that the potential of Stories in this capacity has been mentioned, but it was the first time Facebook had noted that it was going to happen so quickly. 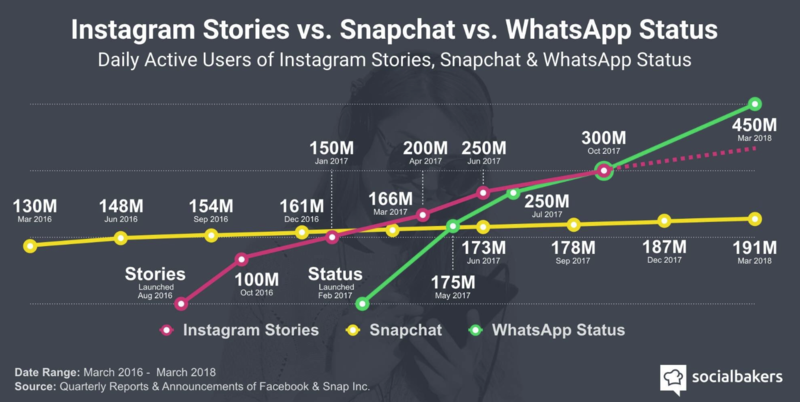 Previously, Facebook CEO Mark Zuckerberg had said that Stories were on track to overtake traditional feed-based sharing, but the fact that it’s likely to happen this year surprised many, and underlines the significance of the social stories shift. Which would also explain why Facebook is so keen to keep pushing Facebook Stories, despite the seeming lack of audience interest. On this, Facebook has announced three new options coming to Facebook Stories. The new tools are specifically focused on the Indian market – one of the company’s fastest-growing user bases – but will be rolled out to all users soon. The first new feature is audio posts, which will enable users to post audio clips to their Facebook Stories, accompanied by a colorful background. The option will enable more creative capacity to users on lower bandwidth, for whom videos may not always be an option, with audio providing a more engaging, interactive option to combine with images. Facebook's been testing a similar option in News Feeds, with some users seeing a new option to share voice clips as status updates. Being able to record voice clips expands the creative options of the platform, and aligns not only with usage in India, where it can help alleviate language barriers (with so many different languages spoken in the country, not everyone can write in each), but it also connects with the rising use of voice search in western nations, which could become a more significant consideration. Interestingly, we’ve also just had our first audio-only viral debate, with the Laurel/Yanny clip. Could this be a sign of things to come with more creative, audio-only options? Facebook will also add a new Stories archive to Facebook, similar to what they added to Instagram back in December. As you can see here, soon you’ll see a new ‘Your Archive’ option at the top of your Stories feed, which will give you access to all the Stories content you’ve previously posted, enabling you to re-use older content. The archive will also give users the chance to re-share their Stories content to the News Feed, expanding the value of Stories posts. The archive option is particularly handy for brands on Instagram who want to show off specific products or themed content within their profile, though it’s not clear that same capacity will be available on Facebook proper as yet. And the last new update will enable users to save their Facebook Camera clips and images direct to Facebook, as opposed to taking up room on their device. This serves two purposes – for one, it will enable users with limited memory capacity to still save their content. Phone capacity is a big problem for many – with so many images being taken and uploaded every day, it can be easy to max out your space. In addition, it’ll also mean users can save content for later, rather than having to post at that exact second. So if you want to enjoy the moment, without focusing on editing and captioning your Stories posts, you can take a video or picture, then upload it to your Stories feed later, when you have free time. While the focus of these tools is the Indian market, the new options will – when rolled out – provide new capacity to all users, and new considerations for marketers. And while Facebook Stories may still seem like a ghost town to many, given Facebook’s focus, it is likely to become a bigger trend. The addition of new AR tools and options will drive increased usage, and the usage trends show that Stories is going to become a more significant consideration in future. Facebook Stories, specifically, is not on this chart, because Facebook hasn't released any usage stats (though they say the numbers they're seeing are "encouraging"), but still, the broader shift is clear. It’s worth investigating how you might be able to incorporate Stories, and their expanding functionalities, into your digital marketing efforts.